We’d love your help. 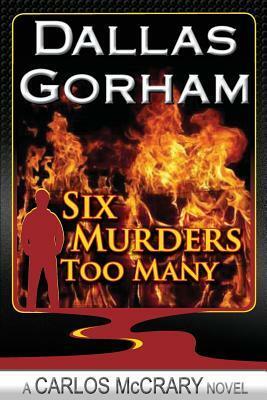 Let us know what’s wrong with this preview of Six Murders Too Many by Dallas Gorham. "I love complicated mystery plots, and Dallas Gorham gives us a doozie..."
To ask other readers questions about Six Murders Too Many, please sign up. In reading Dallas Gorham's detective novel, Six Murders Too Many, the term "everything but the kitchen sink" immediately comes to mind. The author has stuffed his book full of killings (considerably more than six over the course of the book), suspects, criminal schemes, gorgeous women, shady characters, mobsters, hitmen, and cops from virtually every jurisdiction in North America, all tied together by Gorham's hero, PI Carlos McCrary, whose own history contains just about everything but the kitc In reading Dallas Gorham's detective novel, Six Murders Too Many, the term "everything but the kitchen sink" immediately comes to mind. The author has stuffed his book full of killings (considerably more than six over the course of the book), suspects, criminal schemes, gorgeous women, shady characters, mobsters, hitmen, and cops from virtually every jurisdiction in North America, all tied together by Gorham's hero, PI Carlos McCrary, whose own history contains just about everything but the kitchen sink as well. Surprisingly, the mix generally works well, thanks to some skilled writing and meticulous plotting by the author, but occasionally, there's just too much in there for my tastes. McCrary is an ex-cop, ex-Special Forces Operative whose fledgling detective agency manages to land a wealthy client, a multimillionaire whose father recently died. Daddy had a gorgeous young wife who has since had a baby she claims is an heir to half the family fortune, and Carlos’ client wants him to prove that the woman is a fraud. As Carlos starts investigating, however, the case keeps getting bigger, and a simple case of fraud might be tied into the murders of two other heirs to the family fortune as well. Further, the investigation appears to be making someone very nervous, since Carlos finds himself the target of some out-of-town hit men on more than one occasion. Six Murders Too Many is the first book in a series featuring McCrary and possibly author Gorham’s first novel as well. For a rookie effort, it’s quite impressive. The book’s plot proves to be rather complex, requiring some lengthy explanation at various points in the story by McCrary, who serves as narrator, and by some of the other characters as well. On occasion, these explanations get a bit repetitive, but they are generally easy to get through. The author is quite skilled at constructing a smooth flowing text and knows how to turn a colorful phrase as well. McCrary is also fairly witty, so Six Murders Too Many has a fair number of clever witticisms (“better an old worrier than an optimistic young corpse”). However, unlike many fledgling detective novelists, Gorham avoids the temptation to turn the police into moronic foils and straight men for his hero, so McCrary never delivers the typical snarky retorts to the many cops he encounters. To the contrary, one of his best skills is the ability to schmooze the police to get information and, at times, do a lot of the heavy lifting in the investigation. They also help steer him in the right direction on a number of occasions. Along that line, one of the most enjoyable aspects of Six Murders Too Many is McCrary’s fallibility. He’s a dogged investigator, but he’s no Sherlock Holmes or Hercule Poirot, so he winds up going down the wrong track a couple of times. Part of the fun in the story is seeing McCrary figure out what he’s done wrong and start over. Unfortunately, while the author avoids a number of common traps for novice mystery writers in Six Murders Too Many, he does go overboard on the number of gunfights and chases in the book. McCrary avoids being killed several times and shoots it out with the bad guys on more than one occasion, and while there’s nothing wrong with some action in this type of book, common sense would dictate that the villains here would definitely not want to call attention to themselves by murdering a private detective under circumstances that would get the case even more attention from the police. In a similar vein, McCrary winds up being chased and lusted after by virtually every female character in the book and winds up bedding several of them. His degree of prowess with women winds up being almost comical, so much so that I wondered how McCrary ever solved the mystery since he spent seemingly half his time in the book dodging bullets or bedding babes. I gave it a 3 because the good guy never misses when he shoots, and the ladies always go to bed with him. So, right away, the book is not realistic. 😁 I enjoyed the book other than that. The investigation keeps turning up stuff for everyone to keep wondering who done it. Think black widows, ED pills, a baby, a dermatologist, a tennis pro, a country club, an arson and arsonist, six murders, Cleveland, Houston, Port City, Alaska, the Bahamas, Mexico; put it all in a blender, and there you have it. This is a great story that moves quickly and really keeps you guessing as to who is the murderer. The characters are well thought out and the plot is complicated enough to keep you reading but not so complicated that it's confusing. Overall an excellent book with enough mystery, romance, humor and action for most readers. I loved it. Read it. You will too. From the first page I was involved in the story, cared about the characters, enjoyed Carlos’ thought process, wondered what was going to happen next and was hooked to the last page. Cannot wait to get into the next and the next and the next adventures. Loved the book. The characters were well thought out and introduced to the reader with completeness. I mean you didn't get just bits and pieces, as in some novels, during the course of the story. The author keeps the reader's interest and moved the story along at a quick pace. I opted for this book as it and the author were new to me...and it was free. I am glad to purchase other offerings from this author. Good luck with your career as an author!! Dallas Gorham is a sixth-generation Texan and a proud Texas Longhorn, having earned a Bachelor of Business Administration at the University of Texas at Austin. He graduated in the top three-quarters of his class, maybe. Dallas is also a reluctant Dallas Cowboy fan (Cowboy fans: You know how it is. But he has no choice… He’s named after them, sort of.) Like his fictional hero, Chuck McCrary, he now Dallas Gorham is a sixth-generation Texan and a proud Texas Longhorn, having earned a Bachelor of Business Administration at the University of Texas at Austin. He graduated in the top three-quarters of his class, maybe. Dallas is also a reluctant Dallas Cowboy fan (Cowboy fans: You know how it is. But he has no choice… He’s named after them, sort of.) Like his fictional hero, Chuck McCrary, he now lives in Florida in a waterfront home, where he has followed his lifelong love of reading mysteries and thrillers into writing them. Dallas is an active member of the Florida Writers Association and a Senior Affiliate member of Mystery Writers of America. He chairs the Central Florida discussion group meetings of the Florida Chapter of the MWA, because no one else will take the post. Like his fictional hero, Chuck McCrary, he lives in Florida in a waterfront home where he and his wife watch the sunset over the lake most days and where he has followed his lifelong love of reading mysteries and thrillers into writing them in his home office. He is a member of Mystery Writers of America and the Florida Writers Association. He also chairs the Central Florida annex meetings of the Florida Chapter of the Mystery Writers of America because he can’t get anyone else to take the post. When not writing fiction, Dallas is frequent (but bad) golfer. He plays about once a week because that is all the abuse he can stand. One of his goals in life is to find more golf balls than he loses. He also is an accomplished liar (is this true?) and defender of down-trodden palm trees. Dallas is married to his one-and-only wife who treats him far better than he deserves. They have two grown sons whom they are inordinately proud of. They also have seven grandchildren who are the smartest, most handsome, and most beautiful grandchildren in the known universe. He and his wife spend waaaay too much money on their love of travel. They have visited all 50 states and over 90 foreign countries, the most recent of which was Morocco, where their cruise ship stopped at Agadir (don’t bother).